For the Ka’apor people of Brazil, protecting the Amazon rainforest isn’t just about climate change or wildlife. It’s about survival. The Amazon's Alto Turiaçu Indigenous land, home to the Ka'apor people, is surrounded by illegal logging and deforestation. Lately, the forest has needed a lot of defense. The Ka’apor live in a fragment of the Amazon rainforest—the Alto Turiaçu Indigenous Land—that is surrounded by deforestation. And that fragment has been shrinking as the global appetite for Amazon timber grows. Loggers are sneaking into Alto Turiaçu illegally, gouging roads into the forest floor and removing valuable tree species. In less than three decades, the Ka’apor have lost 8 percent of their land to illegal logging. Meanwhile, logging criminals are profiting, using fraudulent paperwork to sell the timber to markets in Europe and the United States. 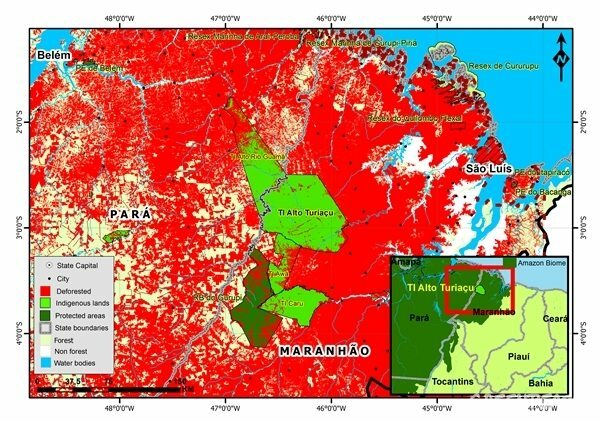 Satellite imagery shows the Alto Turiaçu Indigenous Land (bright green) surrounded by deforested areas (red) in the southeastern portion of the Amazon rainforest. Despite decades of pleas to the authorities, the Brazilian government has done little to protect their land. So the Ka’apor have taken matters into their own hands. Since 2013, Ka’apor leaders have stepped up where the Brazilian government has failed, coordinating their own surveillance activities to stop illegal logging in Alto Turiaçu. Ka’a usakha’—or forest guardians—patrol the land to look for signs of destruction. Some Ka’apor families have even moved from their villages to live in the paths most used by loggers, putting themselves between the loggers and the rainforest. But while these bold actions have helped curb deforestation, they have come at great cost and risk to the Ka’apor. According to the Indigenous Missionary Council (CIMI), four Ka’apor were killed and 15 leaders were attacked in the last four years. Eusébio Ka’apor, one of the community’s most active leaders in the fight against deforestation, was shot dead returning from a visit with his son earlier in 2015. This crime still has not been properly investigated by local authorities. Ka’apor have had to put everything on the line to protect their land and heritage. But now their patrols are about to get a lot safer, and perhaps more effective as well. 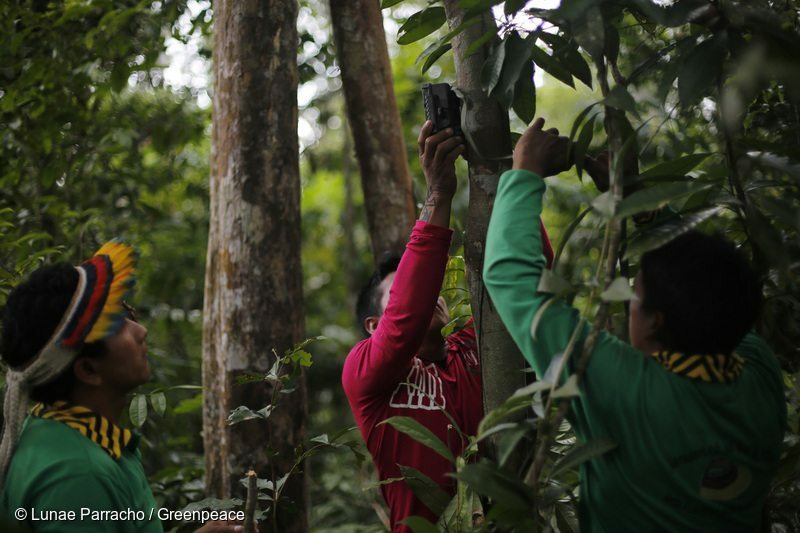 Ka’apor activists set up trap cameras in areas frequented by illegal loggers. Photo by Lunae Parracho / Greenpeace. Answering a call from the Ka’apor people, Greenpeace Brazil has teamed up with Ka’apor leadership to find safer ways protect their lands using remote surveillance technology. And this August, Ka’apor and Greenpeace activists met in Alto Turiaçu to make their plans a reality. 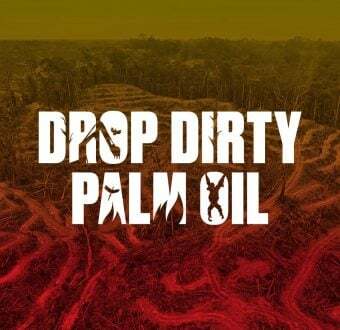 Together, Greenpeace and the Ka’apor built more accurate maps of the landscape and installed motion and temperature sensor cameras to document the invasion of logging trucks inside Ka’apor territory. Greenpeace also provided the Ka’apor with electronic tracking devices to monitor logging trucks as they travel in and around the Alto Turiaçu Indigenous Land. 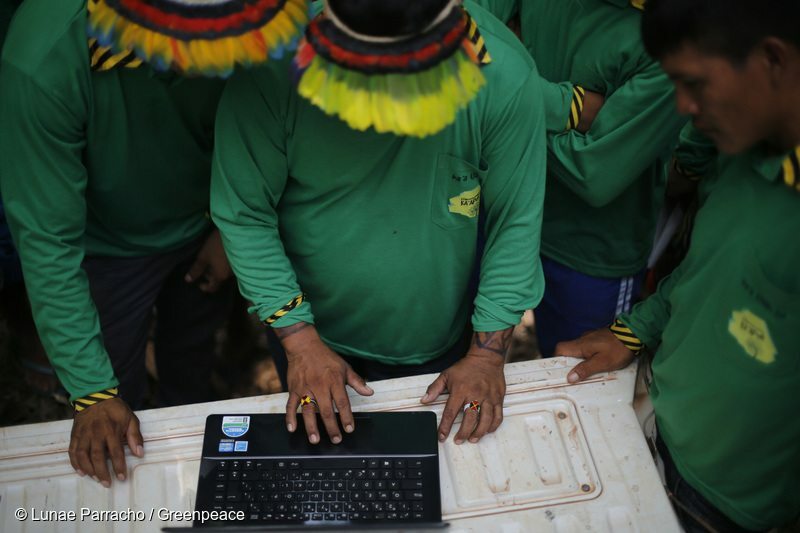 This new capacity to monitor for illegal logging remotely makes protecting the forest safer for Ka’apor activists, and provides more information than they’ve ever had before to find and stop illegal operations. And because these tools capture hard data about the illegal activity of loggers in the region, they can expose how pervasive the problem is—putting pressure on the Brazilian government to act. While this new system puts the Ka’apor at an advantage over the loggers, the best long term solution to stopping deforestation in the Amazon must come from the Brazilian government itself. Authorities must close the loopholes that make it possible to launder illegal timber and ensure full and effective protection for all indigenous lands in the country. Greenpeace is also demanding that buyers of Amazon wood look beyond easily misappropriated official documents to ensure that Amazon timber smuggled from indigenous lands is excluded from their supply chains. The Amazon isn’t safe from illegal and predatory logging until international buyers start paying more attention and the government steps up enforcement. Until then, the Ka’apor will be watching over their forests. This article was originally published by Greenpeace International on September 10, 2015. Marina Lacorte is a timber campaigner at Greenpeace Brazil.